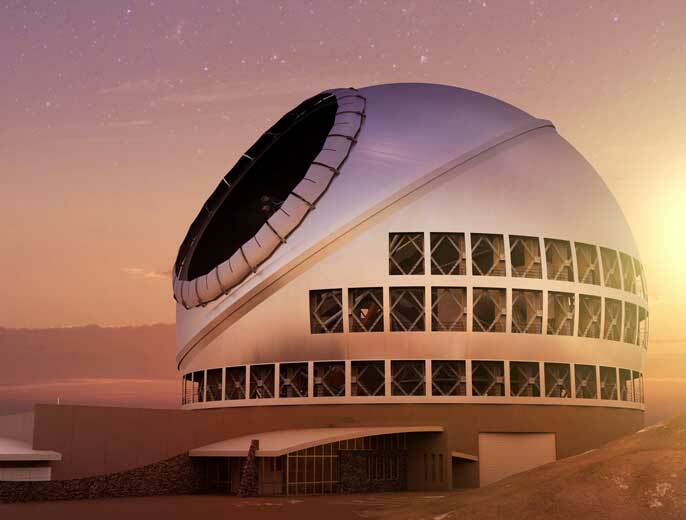 The Thirty Meter Telescope (TMT) —which has been spearheaded by UC and the California Institute of Technology since 2003— will be built and run by a consortium of universities and scientific organizations from around the world. Special adaptive optics will correct for the blurring of Earth’s atmosphere, enabling the TMT to study the universe as clearly as if the telescope were in space (In fact, it has 12 times the resolution of the Hubble Space Telescope). It will be able to focus on and identify extremely distant structures that currently appear as blurry smudges in the Hubble Deep Field. As yet, no one knows what these objects are. This new resolution will provide insights into the both dark matter and dark energy. And it will widen the search for planets orbiting stars outside our solar system. For the first time, we will be able to routinely image direct light from these exoplanets, garnering information on their atmospheric chemistry and dynamics.